The Chase Ink Business Unlimited Credit Card offers a lot of upfront value, plus the chance to earn a simple rewards rate on every purchase. For a small business, this card can make a ton of sense—especially if you don’t want to juggle multiple cards or think about where you’ll earn bonus rewards. If you like maximizing rewards, however, you won’t get much of a chance with the Chase Ink Business Unlimited. To find the card that’ll give you the best rewards for your spending, check out the CardCruncher tool. Otherwise, here’s what you need to know about it before you submit an application for the Chase Ink Business Unlimited. Bottom Line: Should You Apply for the Chase Ink Business Unlimited? Minimum Payment: The greater of $25 or 1% of the full balance, plus the current statement’s interest charges and late fees. A sign-up bonus of $500 isn’t unheard of, but it’s not common for cards with an annual fee of $0. If you want an injection of value up front, this card gives it to you. If you don’t want to keep track of bonus categories and complicated rewards structures, the Ink Business Unlimited card is a good fit. It offers a flat 1.5% cash back on every purchase; no exceptions. The APR of 0% for 12 months, then 15.49% to 21.49% applies to both balance transfers and new purchases. That means you’ll have time to pay off a large expense, ongoing operating expenses, or a balance from another business credit card. Here are some potential pitfalls that might make you think twice about the Ink Business Unlimited card. If you do like the idea of earning more rewards on your more common expenses, this card won’t be the best fit. Some other business credit cards offer up to 5% cash back on everyday business expenses, like on utilities or at office supply stores. Many credit cards have a balance transfer fee of 3% of the transfer, but the Ink Business Unlimited card charges 5%. While that won’t necessarily neutralize your savings entirely, it may be worth looking for a card with a lower fee if transferring a balance is your top priority. Some other business credit cards offer up to 2% cash back on every purchase. While the Ink Business Unlimited earns valuable Ultimate Rewards points, you can’t redeem for more valuable travel or partner transfers without another premium Chase credit card. If you’re on the fence about the Ink Business Unlimited Credit Card, here are a few other cards to consider. This card is virtually identical to the Ink Business Unlimited Credit Card in every way, except for their rewards structures. The Ink Business Cash card offers 5% cash back on the first $25,000 you spend in combined purchases at office supply stores and on internet, cable and phone services each account year. It also earns 2% cash back on the first $25,000 you spend in combined purchases at gas stations and restaurants each account year, and 1% cash back on everything else. If you spend more on utilities and dining, you can really come out ahead. The Capital One® Spark® Cash for Business offers a one-time cash bonus of $500 after you spend $4,500 in the first three months, plus 2% cash back on every purchase. The only downside is that the card charges a $95 annual fee after the first year. 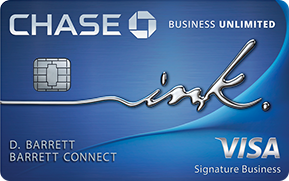 If your business spends more than $19,000 per year, though, you’ll earn more with this card over the Ink Business Unlimited Credit Card, even with the annual fee. Here are some other questions we’ve come across in our research about the card. Does the Ink Business Unlimited card earn Ultimate Rewards? Yes. The Ink Business Unlimited is technically a cash-back credit card, but the rewards are actually Ultimate Rewards points. You can use your hard-earned points to buy gift cards, book travel, or shop on Amazon.com. If you have another Ultimate Rewards-earning card, you can also transfer your points between accounts. And if you have a premium card like the Chase Sapphire Preferred, you can further maximize your points by redeeming at better travel rewards rates or by transferring points to partners. Are Chase business cards subject to the 5/24 rule? Chase has a rule that it won’t approve your application for many of its credit cards if you’ve opened five or more credit card accounts in the last 24 months; that includes authorized user accounts. It’s hard to say whether all Chase business credit cards are subject to the rule. However, the Ink Business Unlimited card is. If your business spends enough to earn the card’s sign-up bonus, but not enough to earn more with the Capital One® Spark® Cash for Business, the Ink Business Unlimited Credit Card will be a good choice. It’s also worth considering if you need an introductory 0% APR promotion to pay down other high-interest debt. That said, rewards maximizers might want to look elsewhere for better opportunities. Don't see what you're looking for? Ask a question here about Chase Ink Business Unlimited: Earn 1.5% Cash Back on Everything and one of our experts will get back to you.